Vote the bums out! Call Congress! Take it to the Supreme Court! These are the calls of political activists nationwide. But, these methods have proven to be a complete failure. It doesn’t matter which political party holds power in DC, federal power always grows to the detriment of your liberty. Like the marshmallow monster in the movie Ghostbusters, the federal government ranges across America from sea to shining sea. It wraps itself in red white and blue bunting, bullying, badgering and browbeating citizens to get its way. Over the last 100 years, the monster from the Potomac has grown exponentially, shoving its tentacles into nearly every nook and cranny of American life. Conceived as limited and delegated with enumerated powers for very specific purposes, the United States federal government morphed into an institution with nearly unlimited power, scope and authority. Like the kudzu vine so familiar in southern states, it continues to grow at a chilling pace. Chop off one stem, and two quickly grow back to replace it. No rational American believes that the United States can simply continue on its current path. We’ve maxed out the credit card and the bank is calling in the loans. The American people can either take proactive steps to shrink Washington D.C. and gain control of the overreaching federal monster, or the system will eventually collapse on itself. Americans must begin clearing the landscape of the federal vine, allowing other important institutions to once again bask in sunlight so that they can thrive and flourish. One-size-fits-all solutions handed down from a centralized bureaucracy, completely disconnected from the people, make for crappy policy. We marched to Washington D.C., waved signs and protested. We sent letters to our congressional representatives. We begged them to change things. They ignored our pleas. We voted the bums out. Only to wake up the next morning and realize we’d just elected a new set of bums. We sued in federal court. Federal judges ruled to expand federal power. So, what’s left? Have we run out of options? Do we just bow down and accept Uncle Sam as our overlord? Michael Maharrey doesn’t think so, and he offers up one last hope – a forgotten path to liberty – first introduced by Thomas Jefferson and James Madison in 1798. Jefferson called it the rightful remedy. Madison called it a state’s duty and obligation. But what exactly is nullification? Is it really constitutional? And why do so many on both the political left and right revolt in horror at the mere mention of the “N” word? 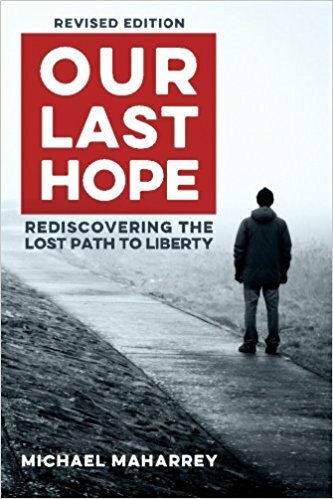 In Our Last Hope – Rediscovering the Lost Path to Liberty, Maharrey explores the moral, philosophical and historical case for nullification, places it in a 21st-century context and shows why it truly does represent the last hope for liberty in America. The message? If this new course isn’t taken – and taken now- liberty will be lost forever. Order an autographed copy Our Last Hope – Rediscovering the Lost Path to Liberty at HERE. It is also available on Amazon.com, both in paperback and Kindle formats. And now you can purchase the audiobook version. Just click HERE. Here’s a short excerpt from the audio version of Our Last Hope. Please do some research on the Blog that recently came across. It appears to be as stated, sourced from those, the .01% AKA NWO~Globalists, that see themselves as in CONTROL of the masses. I think that it will enlighten any that care about why things are as they are. Your book, in the meanwhile, offers an extremely important solution.